Early in the summer of last year, a small screw-steamer was built of iron by Mr. Laird, of Birkenhead, for the Maule River, South America. The vessel is named the Fosforo; her register is 43 tons, and 40-horse power (engines by Mr. E. Humphreys); depth of hold, 6 feet; length over all, 105 feet. She left Liverpool on July 17, when she was loaded to a foot and a half of the water's edge. She was rigged as a three masted schooner, and had no keel. The ship's company consisted of commander, two mates, two engineers, two firemen, and six men; and the Fosforo arrived at Valparaiso on the 15th of November, having touched at Madeira, Rio Janeiro, and Monte Video, for the purpose of coaling. The total consumption of coals of various kinds was 160 tons, equal to 138 tons of Welsh coal. The passage occupied 121 days, 46 of which were under steam and sail, and 28 days under sail alone; having averaged six knots an hour all the way out. The remainder of the time was consumed at the various ports touched at, in coaling, and repairing some trifling accidents of machinery, and at anchor through stress of weather in the Straits of Magellen. The Fosforo is the smallest steamer that ever performed so long a voyage, the following details of which have been communicated by Capt. Walter Hall, the commander of the vessel; a somewhat fuller account appears in the Sailors' Home Journal. "Off the River Plate, we experienced heavy weather, with a high cross sea: the vessel behaved well, but required steam to keep her bow to the sea. We passed along the coast of Patagonia, and entered the Straits of Magellan in the month of October—in these parts, the worst month of the year. The weather was so tempestuous, that we were compelled to steam close in shore, where we found smoother water, and sometimes eddies in our favour; but, in navigating so near the shore, great care was necessary to keep the screw clear of the kelp, which is here so abundant, that the way of the vessel was frequently stopped. The passage through the Straits—entering at Cape Virgins, and quitting them at the Gulf of Penas—occupied eighteen days, thirteen of which we were at anchor from stress of weather; the remainder of time (five days and eight hours) the vessel was under steam, and ran about 700 miles. 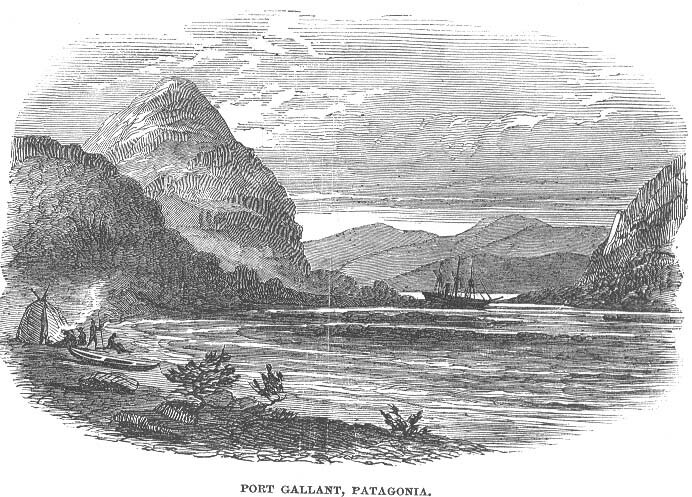 "We passed Port Bulnes—the small Chilian settlement which will, no doubt, eventually become a coaling port for steamers passing through the Strait—anchored at Port Famine, where we fortunately found coal, on the bank of a rocky cove, left there by a ship in distress, which we embarked with considerable risk, from the difficulties of the place, combined with the tempestuous weather, and the smallness of the only boat we had, which was but 14 feet long. "We anchored at Port Gallant, where the steamer was laid on the beach, to unship the screw, and put another collar on the shaft, This is the best anchorage in the Strait: from the stillness of its waters, it is a perfect wet-dock; and, from its position, invaluable: we entered at night, and were caught in a south-west gale, 80 common in the Strait. "Anchored at Port Tamer, where I found two vessels stranded; these afforded me an ample supply of wood for fuel. After leaving this port, in thick weather, I discovered a channel four or five miles to the westward of Cape Philip, which is not laid down in the chart of the late survey of the Strait. I ran up to its northern extremity, steering N.N.W. by compass, a distance of eight or nine miles, when I anchored in a snug cove, in three or four fathoms, for the night. This inlet is about a mile and a half wide, decreasing to half a mile. I have no doubt there are many good anchorages here, and I think the place would be altogether eligible for steamers to stop, being the last good anchorage on the north side of the Strait. I passed through Smyth's and other channels to the northward, and entered the Pacific by the Gulf of Penas, where It blew nearly a hurricane for three days, from S.W. to N.W. "I should have endeavoured to escape these tempests but for our short supply of provisions, by attempting the passage alluded to by Byron, in his interesting narrative of the loss of the Wager, as communicating with the Gulf of San Rafael, through which the Indian guide tried to take the Wager's barge, but was unable to do so by the strength of the current. On the 15th December we left Valparaiso, in the face of a fresh southerly gale, for the River Maule (appropriately called the Thames of Chili), a distance of 150 miles southward. Our ship's company then consisted of myself one mate, one engineer, one stoker, two sailors, and a cook. The bar of this river is a great drawback to the success of the port, and the country adjacent. Sailing vessels are sometimes detained for three months. The river is probably navigable for steamers drawing three or four feet of water. "Advancing beyond this, great difficulties occur from the shallowness of the water, and quick turnings of the river; when heavy falls of water are met with in the narrow and crooked reaches, and large stones are frequently hurried down by the strength of the cur­rent. The banks of the stream are very picturesque, the foliage extending to the water's edge. "I cannot close this imperfect account without mentioning the favourable impression made on the natives by the appearance of the little steamer going full speed up this river, which had never before been navigated by steam; she was crowded with the inhabitants of Constitution, who were much delighted with their trip. Nothing surprised them more than the easy way the steamer turned in the narrow and crooked reaches we had more the appearance of a pleasure party than an exploring expedition. "I should add that the Fosforo was sent out by Messrs. Brownells and Co., at Liverpool, to Joshua Waddington, the enterprising merchant of Valparaiso." 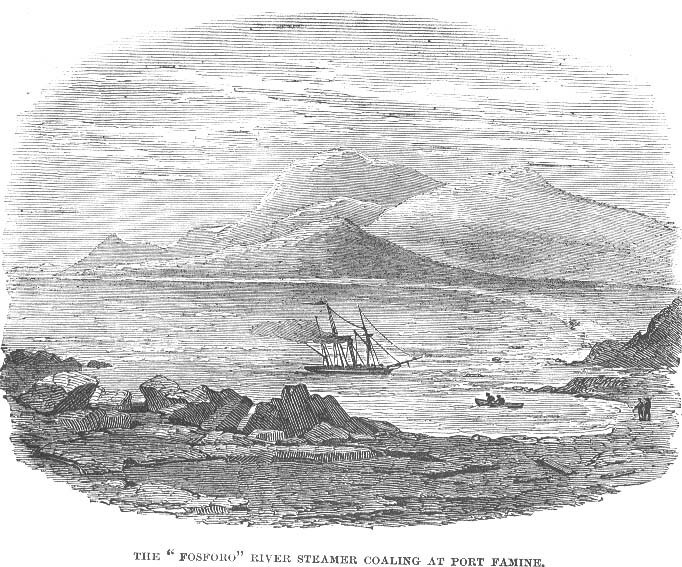 The first of the accompanying Illustrations (from Sketches by Captain Hall), shows the Fosforo coaling at Port Famine, with a littleboat, 14 feet long. Next is the Fosforo lying on onshore at Port Gallant, to unship her screw-propeller. In this Sketch we have a glimpse of the striking coast scenery of Patagonia.